Recipe from Jeannine Shao Collins, Senior Vice President & Publishing Director of Women's Lifestyle Group, Meredith Corporation. 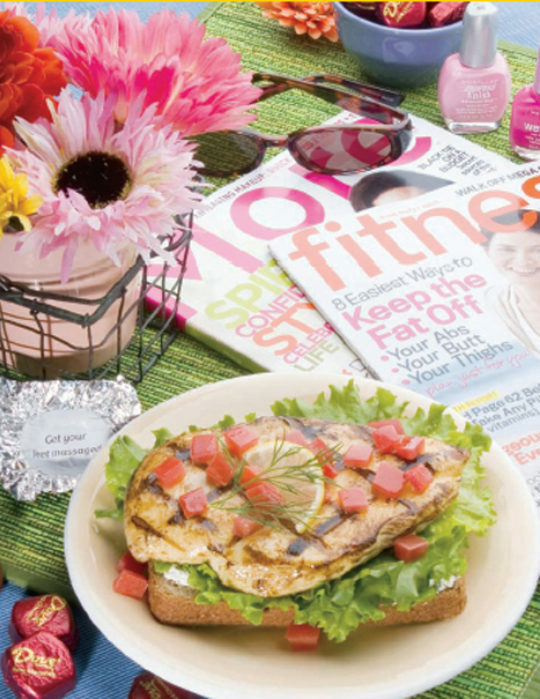 When you're taking a day to pamper yourself, you'll surely enjoy having a wholesome, nutritious and eye-appealing lunch. Remember... it's all about you - and you are what you eat! Celebrate all that you are and want to be. With a meat mallet, pound chicken breasts between 2 pieces of waxed paper to 1/2-inch thick. Season chicken breasts with salt and pepper. Heat olive oil in a medium sauté pan over medium heat. Add garlic and briefly sauté. Add chicken breasts and sauté for 3 to 5 minutes on each side or until the meat is firm and the juices run clear. Remove from pan and set aside. In a medium bowl, mix together the cream cheese, red onion, dill and pimento or roasted red peppers. Spread cream cheese mixture on all 4 slices of bread. Spray opposite side of bread with canola oil spray and toast in a large sauté pan for 30 seconds to 1 minute, or until lightly browned. Place chicken, tomato slice and lettuce leaf on bread slice and serve.